For your business as well as your home, record keeping can be an important but often overwhelming task. Keeping good records is vital for running a successful business, and it’s essential for personal finances as well, especially at tax time. Keeping good records throughout the year, knowing what to keep and what to throw away – or shred – and when, will make tax time and fiscal year-end immeasurably easier. It will also keep you organized on a day-to-day basis. Small business owners often find there is overlap between their business finances and their personal finances, especially when just starting out. To keep organized and avoid confusion, however, it’s important to separate business and personal records. For most people, a system of record keeping that works for business will also work for personal records. Make business purchases through business accounts and credit cards to prevent financial overlap that can create trouble at tax time, and keep your records separate as well. Record keeping can be a simple process when done consistently and according to an established system. Follow these simple steps to create and maintain a record-keeping system at home or for your business that will keep you in control. Whatever system makes the most sense to you, choose one and stick with it consistently. If you are technologically motivated, purchase and use software to help you keep track of records. If you prefer to record things manually, use an accounting book. At home, you can choose to do the same thing, recording important information including transactions through a software program or by recording everything in a register or log. Remember that even once you record information, you may still need to keep original paperwork as evidence for tax purposes. Nothing derails the organization of records faster than getting behind on the process. Choose a set day and time to sit down with your paperwork and complete the recording process. Keep to this schedule to avoid paperwork piling up into overwhelming chaos. Depending on how much there is to record, this may need to be done weekly, monthly, or quarterly. Choose the schedule that works best. Reduce the paper load by throwing away or shredding paperwork as soon as you no longer need to keep it around. At home, this can include throwing away receipts for small purchases, utility bills, and statements that can pile up. Both at home and for a business, it’s important to know how long certain paperwork needs to be kept, especially as it relates to taxes. 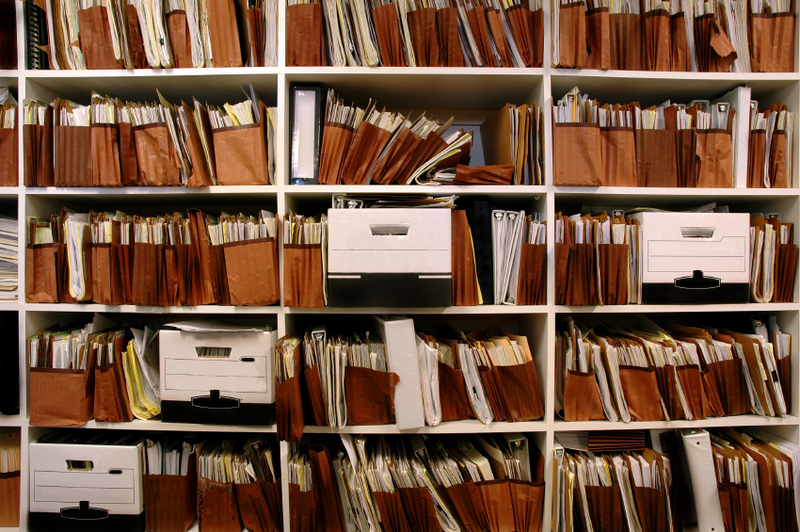 Documents that need to be retained should be filed as soon as possible to get them out of the way and organized. You can reduce paper by using a scanner to create images of important documents – but be certain this information is backed up and secure. Some paperwork can be cleaned up on a weekly basis, while other items may need to be kept through the end of the year or longer. Mobile apps can help you to record details of transactions everywhere you go. By downloading an app to your phone, tablet, or other device, you can keep up on record keeping no matter where you are. Another benefit of these apps is that many include cloud storage, so that you have a backup created – automatically in many cases. As the National Archives notes, keeping good records is important not just for you, but for the government as well. Once you have an established system and you stick to it for a while, it will become easier to keep up with future records. While getting started and dealing with backlog can be difficult at first, in the long run things will run more smoothly for you both at home and at work.